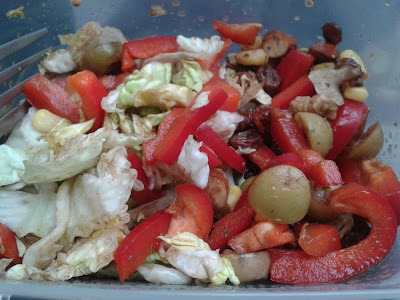 Salad to me means a whole lot more than a bunch of lettuce leaves and a couple slices of tomotoes thrown on a plate. If it doesn't look and/or taste appetizing then I'm not touching it. I can't emphasise enough how much I believe that healthy eating needn't equal boring eating. Mix all the ingredients in a bowl. Easy as that.